I started bowhunting when I was about 25 yrs old. I didn't take to it as quickly as my friends did. I thought it was a great way to catch up on some sleep on a warm afternoon. When I did take the time to go, I usually hunted property owned by my friends parents. It was a piece of land I knew well having spent a lot of time there with these guys who were more than friends, they were like bothers. I remember the first shot I had with a bow was on that property. It was a warm morning and I was sitting in a ground blind made of small trees about 8 inches in diameter. I heard some noise over my left side. Looking between the logs I could see four does and a 6-point buck. I drew back and slowly stood fully expecting them to run, but they stood there looking at me. I took aim at the six and loosed my arrow, which stuck in the ground beneath him. Needless to say, they didn't wait for me to nock another arrow. My second shot came from a ground blind in a field on the same property. It was a chair behind two posts with black plastic between them. I sat (or slept) for a few hours when a doe seemed to materialize out of nowhere. Having been through this before I was determined not to miss low so I proceeded to send my arrow over her back and again she wasted no time in hightailing it out of there. Well, as life has a way of throwing curveballs at you, my time with my friends grew less and less and my time at work and with the kids grew more and more. 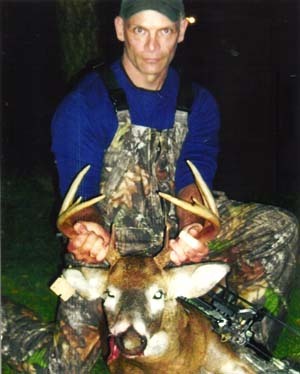 I still hunted with my brother Dave during gun season, but didn't pick up a bow again until 2009 which was 22 years since missing that doe the last time. 2009 found me as part of a group leasing land in Maraton, NY and this is the year I resolve to get back into bowhunting and take it more seriously this time. I sat in my climber with my PSE bow quite a lot and saw a nice 8 and a 10 on seperate occasions, but never close enough to shoot at. I was hooked at that point after seeing all the activity that happens during bow season, which my friends had told me about. I did finally take that 8 pointt during the regular firearm season. 2010 was a similar year in the sense that I bow hunted a lot and saw good action, but had no shots. It was also the year I decided not to get back into the lease with this group and it was also the year I found out my old friends mother was battling cancer and in January of 2011 lost that battle. At the ceremony we shared many memories and they told me I am always welcome to hunt that property. They had told me this many times over the years, but I never took them up on it. I told them I had a ladder treestand if they wanted it and they took it on the condition that I hunt with them, a condition I gladly accepted. Before the season I met with the boys and we decide where to put my stand. They described what sounded like an ideal spot... one they think will be very productive. To my surprise the field is no longer a field it's thick and overgrown with some paths cut through it and there is big tree on the spot where I last sat some 24 yrs ago. We set up the ladder stand in the chosen spot and felt pretty good that someone would get something there. The first day of the season came and we didn't see a thing. Over that first week one of the boys took a nice doe. The following week I shot down after work for an afternoon hunt and chose the stand in the hardwoods. After about an hour I saw antlers coming my way. The buck came to a stop to my left with his head down and behind a tree at 12 yards away. I drew back and let fly what I thought was a perfect shot...it wasn't. Another buck and another shot low. But, I did manage to take some belly hair. Now I'm thinking I'm jynxed. I've practiced a lot and still miss. A few days later my other friend texts that he took a 5-point buck out of the new stand and I better get back out. The next day I took half a day off from work and decided to sit in the fruit tree stand where I missed a doe years ago. Twenty minutes later I saw a head and some bone. I was focused on nothing more than making a good shot when the buck stopped at my scent wick I let the arrow fly and knew in my mind I had made a good shot. The buck turned and in about 3 leaps stopped at 60 yards and stood there. Then, incredibly, he started to walk away! I wanted to cry! I knew I hadn't missed. Suddenly he shuddered, staggered and finally went down. At that point I thought he was a 4-point, but had no idea and didn't care what it was. I waited about 30 minutes and had my phone out calling people, but could only get a hold of a co-woker to tell the story to while I waited. Finally I got to him and couldn't believe it. He was a 10-point! The biggest buck I ever took and my first bow kill. I am not ashamed to admit I was overcome with emotion. It was like being home again after all these years and taking this deer was the icing on the cake. We celebrated later and the new stand has produced 4 deer. I am happy it took almost a lifetime but it was worth it.